Have you ever entered your bathroom and felt like it needed a change? Such beautiful, intimate spaces should always be revived to exceed our expectations and make us feel as comfortable as possible after a tiring working day. If you don’t have the budget to re-paint and re-decorate your bathroom, you might want to go for bath mats and rugs, decorative items that will totally change the appearance of your bathroom. Stripes have entered the fashion industry this year, and because we all like to be in trend, stripped mats for your bathroom will make your space look chic and refreshing. Regardless of your color choice, these rugs are the perfect way of updating your bathroom and make it look more vibrant. Getting up in the morning and going to work can be extremely tiring, but as soon as you step into your comfy bath with beautifully striped mats, that feeling will vanish and you’ll feel more energetic than ever. If your bathroom is small, stripes will make it look larger and a lot more spacious. These bath mats come in various colors and sizes, and the best part is that they can be easily washed in the washing machine. Have you ever entered a bathroom barefoot and wished you had something soft and cozy to make your feet warm? Cotton loop math mats are exactly what you were dreaming of in those moments. Their softness is out-of-this-world and they’re available in so many colors that it’s impossible not to find something to suit your bathroom. 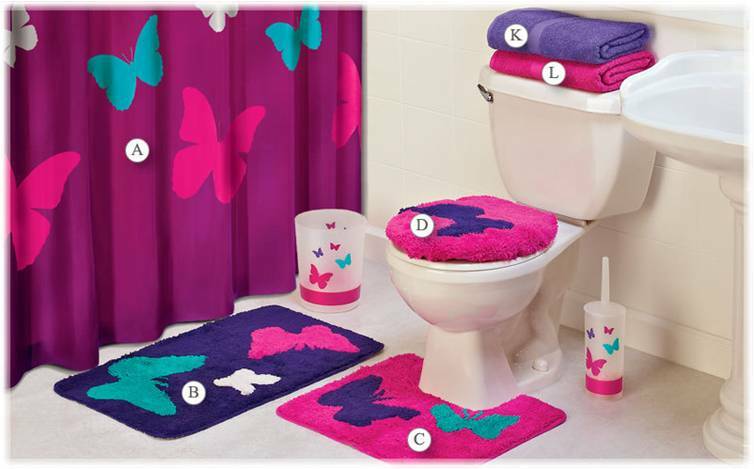 The best part about these bath mats is that they’re suitable for every type of space, regardless of its size. They’re also very fashionable, so they will definitely be admired by whoever enters your bath. If you want to make a smart investment, cotton loop bath rugs are definitely the perfect choice. The beauty of these mats will seem unbelievable, taking into account the fact that they’re so simple. 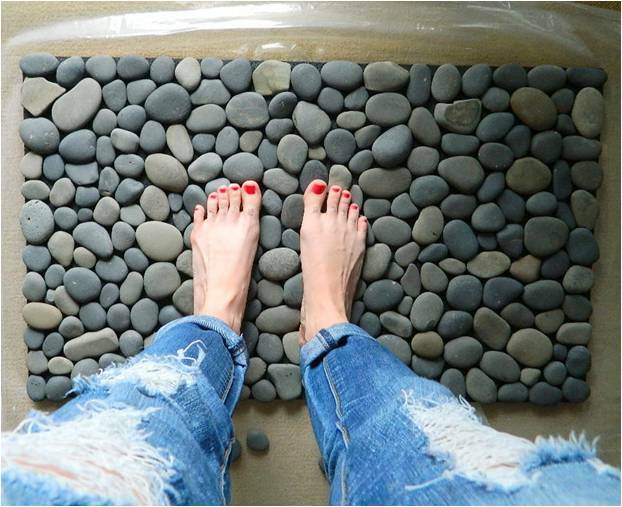 River stone bath mats are made of river stones, which will make your feet feel completely refreshed and relaxed. Just imagine how it would be to step out of the shower and have your feet massaged by this wonderful bath mat. The rocks will make your bathroom seem natural and modern at the same time, an appearance that is not very easy to obtain with other types of mats. 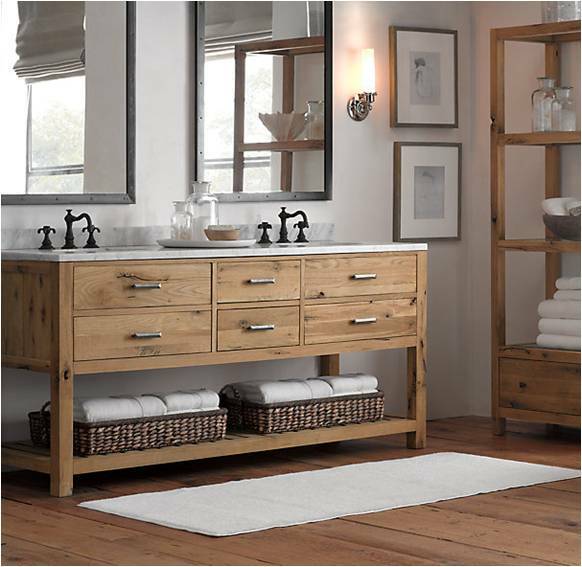 Besides, river stone bath rugs guarantee that you will never slip and fall in your bathroom. Forget about unsightly mats and replace them with a unique river stone bath mat! You may think that there’s nothing special about this type of mat, and that butterflies bath mats can be found everywhere. However, the color is the most important feature of this bath mat. Made of two different shades, these mats will turn every moment spent in your bathroom into something special. First of all, the marine blue will make you feel very refreshed, as if you were swimming in the clearest waters. The beauty of the butterflies and their natural appearance will make your bathroom more beautiful than you’ve ever imagined, while the softness of these mats will make you want to stay there forever. 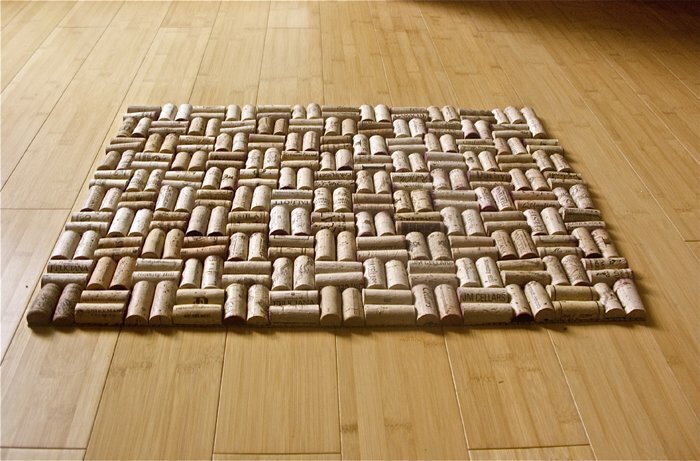 Believe it or not, bathroom mats can be made of corks. Perhaps you should stop throwing wine corks away, as the uniqueness of cork-made bath mats is hauntingly beautiful. You will never have to worry about slipping and falling because cork bath mats are provided with a texture that makes it impossible to slip, and you will no longer have reasons to complain about the lack of originality of your bathroom. Besides, these bath mats can be included in every type of bathroom, as they perfectly match all types of designs and decorations. Regardless of your choice, replacing your bath mats is the best way of completely changing the general appearance of your bathroom. Give your space a total makeover without investing a fortune into your bath décor, and improve appeal with innovative bath mats and rugs. Out of the myriad of options and designs available in the marketplace, you’ll definitely one type to match your preferences; still, if nothing appeals to you, making mats by yourself is a lot simpler than you think.